Our professional concrete driveway staining in Tustin CA can make your driveway a work of art. Whether you’re talking about a residential or a commercial property, the driveway is probably your primary access point, and it will affect people’s impression of the property. A long expanse of plain white concrete can be boring or even an eyesore if it doesn’t complement the overall design of your property. Fortunately, you can transform old or new concrete from blah to beautiful with concrete driveway staining in Tustin CA. 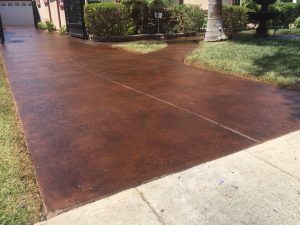 Beautiful: Concrete driveway staining in Tustin CA is a real art form that can add depth, richness, and of course color to otherwise boring concrete. We use water-based stains to give you a full spectrum of hues to choose from. By combining or layering stains, you can create a variegated look that will add even more interest to your driveway. Quick: Most home improvement projects–especially those that will have as big of an impact as coloring your driveway–take weeks or months to complete. Concrete driveway staining in Tustin CA can typically be completed in just two days, giving you maximum impact for minimal time investment. Cost-Effective: At Fuller Concrete Staining, our prices are fair and competitive. Our concrete driveway staining in Tustin CA is certainly very cost-effective compared to the expense of replacing an old driveway or using real stone instead of stained concrete. Concrete driveway staining in Tustin CA isn’t as easy as you might think. It takes skill and experience to get every step right, which is why you need to hire a professional. Fuller Concrete Staining specializes in transforming driveways with stain, and we’ve mastered all the best techniques for this process. You can trust us to help bring your design vision to life, and your satisfaction with the quality of our work is always guaranteed.